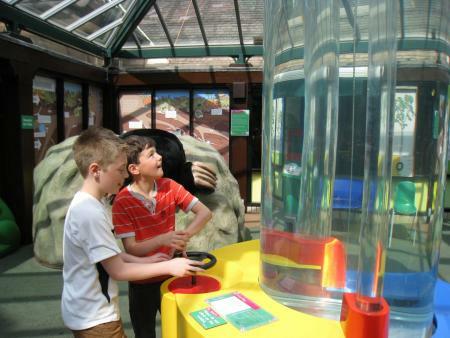 Build a dam, tile a roof, shake your own hand (in an optical illusion) and build a 3D puzzle of the human body − there's all this (and more) to discover at the Look Out Discovery Centre in Bracknell. Read our parent review to find out more. With over 90 interactive science and nature exhibits, the Look Out Discovery Centre is a perfect location for a family day out. It offers something for children (and adults) of all ages, from the indoor stream and mini supermarket to scientific puzzles, facts and interactive exhibits that will interest and challenge parents as well as their children. Lynn Price visited with her three boys, Sam, 6, Toby, 4 and Josh, 22 months. Each of the indoor zones − Forces and Movement, Body and Perception, Light and Colour, Woodland and Water and Build It! 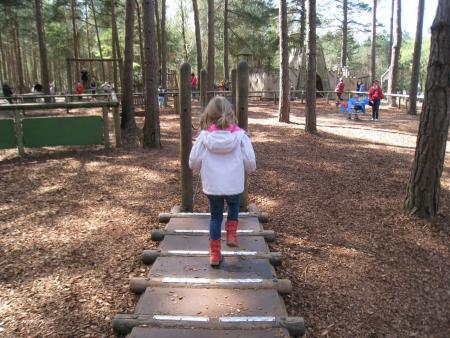 − is exceptionally well designed to ensure that there is something to engage children of all ages; the Woodland and Water Zone combines boats, fountains and leaf rubbing for toddlers with interactive exhibits about locks, food chains and woodland life for older children. The outdoor area, which is free to access, has a wonderful play area that is divided into three zones to cater to all ages and abilities. Mountain bikes and trail routes are also available for those wishing to explore Swinley Forest. There are educational shows for children of all ages that run on weekends and during the school holidays, as well as a variety of themed toddler days throughout term time. The indoor stream with boats, fountains, locks and dams is always popular with younger children. It can get a bit cold in the winter as this area is unheated, but the water is warm and my almost two-year-old son (as well as my older children) would have been happy to play here all day. The Build It! 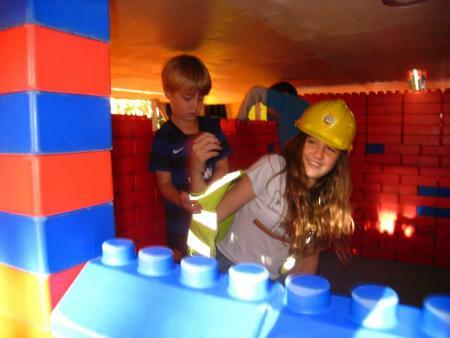 construction site, with its bricks, ride on trucks, tile chute and unfinished house to climb on − complete with hard hats and builders’ jackets − also offers hours of entertainment, with a roof to tile, walls to build and phones to answer. This is one place where my children always team up with a group of new friends to work things out together, from working the tile lift and completing the roof on the construction site to creating dams and closing the lock to raise and lower the water level in the indoor stream. All three of my boys also love the ball pit, mini supermarket and giant keyboard. My six year old loves the Light and Colour Zone, where you can create silhouettes on the wall in the shadow box (great fun for adults as well! ), race to jump on the coloured light beams and attempt to shake your own hand in an optical illusion. The hydrogen rocket, Batak light board, leaf cutter ants and human body jigsaw are also very popular. The Body and Perception Zone has mathematical and scientific puzzles and interactive exhibits that are both challenging and great fun for older children (and their parents!) They can complete an electrical circuit, solve logic puzzles, build a 3D puzzle of the human body, work out how to amplify a radio and test their reaction times on Batak. There are several themed Toddler Days each term, with extra activities including art and craft activities, story telling, face or hand painting. They are very popular so it is advisable to arrive early to avoid the queues. Interactive shows run several times a day at weekends and during school holidays. There is a coffee shop that serves hot drinks and food as well as lunch boxes for children and sandwiches. Prices are very reasonable, with children’s meals from £1.60 and homemade sandwiches from £3.10. It is accessible from the outdoor adventure play area, so a ticket to the exhibition is not required. There is also a large outdoor picnic area. It is open daily from 10am to 5pm (except for 24, 25 and 26 December). Car parking is £2 for four hours, but this is refundable if you pay to visit the science exhibition. Admission is £7.10 (adults), £4.85 (under 16s) and free for under 4s. Saver tickets are available for families (2 adults and 2 children or 1 adult and 3 children, £19.05) and after 4pm (£9.60). 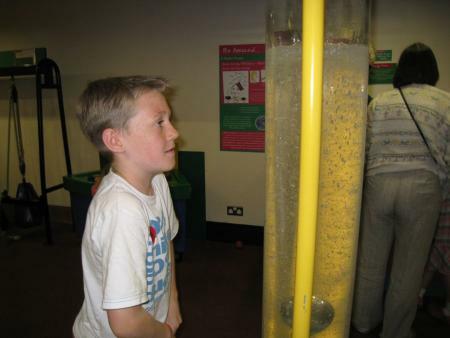 Interactive shows run several times a day at weekends and during school holidays (£1.85). The gift shop offers a wide range of science-based toys and gifts, with a large selection of pocket money items.